Wedding rings featuring diamonds are available in a wide range of styles and price points for women and men. Because of all these options, shopping for diamond wedding rings can get a bit overwhelming. The process is easier if you narrow down the style you have in mind. 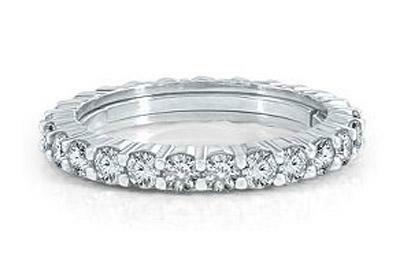 Ladies' diamond wedding bands come in lots of different styles. One of these is sure to meet your needs. Princess-Cut Diamond Band - Featuring 1/3 carat of delicate princess-cut diamonds channel-set in a 14k white gold band, this delicate ring from Blue Nile retails for about $900. White Gold Diamond Band - This delicate wedding ring from Amazon features 1 carat of round-cut diamonds channel-set in a 14k white gold band. It retails for about $1200. Channel-Set Band Ring - This exquisite ring from Tiffany & Co. boasts 0.56 carat of round diamonds channel-set in an 18k yellow gold band. It retails for $3,600. Micro Pave Diamond Band - This exquisite 18k yellow gold ring from DazzlingRock Collection features .90 carat of round diamonds. It retails for around $600. 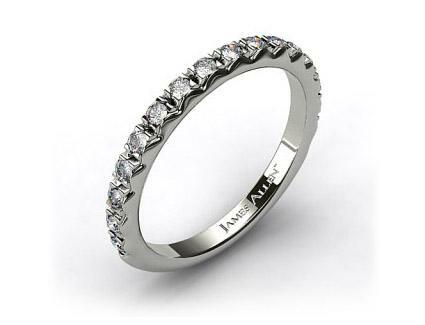 French-Cut Pave Diamond Ring - This beautiful ring from James Allen feature 0.56 carat of diamonds pave-set in a platinum band. It retails for just under $1,500. White Gold Pave Band - This wide band wedding from Zales features one carat of round diamonds pave-set in a 18k white gold band. It retails for about $2,700. Engraved Micropave Diamond Ring - Featuring delicate milgrained edges and an overlapping leaf design, this antique-inspired platinum ring from Blue Nile boasts 0.20 carat of tiny round diamonds. It retails for about $1,200. Art Deco Filigree Wedding Ring - This exquisite ring from Antique Jewelry Mall has 0.23 carat of diamonds set in an elaborately engraved platinum band. It retails for about $3,000. Milgrain Engagement Ring - This amazing band from Greenwich Jewelers boasts a sparkling halo of diamonds surrounding one larger diamond. The sparkling ring features accent diamonds as well and gorgeous milgrain detailing all set in your choice of gold or platinum. The band seels for around $5,000 and the center stone sells separately. French Pave Diamond Eternity Ring - This platinum ring from Blue Nile has one carat of tiny round diamonds that cover the delicate band. It retails for about $3,100. Memoire Diamond Eternity Band - Featuring a half-carat of round-cut diamonds, this 18k white gold band from Helzberg Diamonds has exceptional sparkle. It retails for about $2,300. Platinum Diamond Eternity Band - This pretty ring from Ross-Simons boast .90 carats of round-cut diamonds set in a openwork platinum band. It sells for about $1,700. Pave Sapphire and Diamond Ring - In this exquisite ring from Blue Nile, the 14k white gold band is set with nine tiny colorless diamonds and ten blue sapphires. It retails for just under $500. Swirl Diamond Band - This lovely ring from Kay is crafted in 10k white gold and features a twisting band with 0.05 carat of tiny colorless diamonds. It retails for about $300. Jean Schlumberger Two-Tone Band - This amazing two-tone band from Tiffany & Co. is made of 18k yellow gold and platinum and boasts 0.91 carat of round brilliant diamonds. It retails for $8,500. Contoured Diamond Wedding Ring - The beautiful twisted design of this 14k white gold band from Zles will complement many engagement rings. It features 1/6 carat of prong-set diamonds and retails for about $320. Diamond Bridal Band - This 14k white gold band from Jared features 1/3 carat of tiny round diamonds and has delicate engraving on the sides. The gently curved band retails for about $1,200. Elsa Peretti Wedding Band - This gently contoured platinum band from Tiffany & Co. is decorated with nine tiny round-cut diamonds. It retails for about $1,900. Although there isn't quite as much variety in the world of men's diamond wedding rings, there are plenty of amazing styles to choose from. One is sure to be perfect for you. Black Stainless Steel Band - This black stainless steel ring from Kohl's offers an alternative to precious metals. It features 1/10 carat diamonds in a slant design and retails for about $80. Seven-Stone Slant Band - This polished 10k white gold ring from Zales features a slanting row of one carat of round brilliant diamonds. It retails for about $1,600. Seven-Stone Two-Tone Band - This channel-set band from Zales is made of 10k white gold with 10k yellow gold accents. 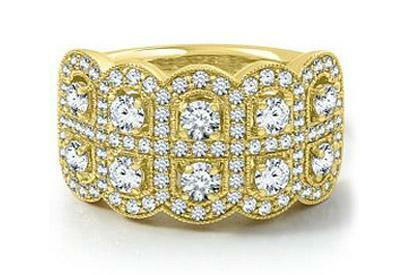 It features one and a half carats of round brilliant diamonds and retails for $2,500. Yellow Gold Diamond Wedding Ring - Featuring one carat of round channel-set diamonds, this 14k yellow gold ring from Ross-Simons is a beauty. It retails for about $2,500. Sculpted Crescent Diamond Band - This elegant ring from Tacori features nine square diamonds in a textured platinum band. It retails for about $5,400. 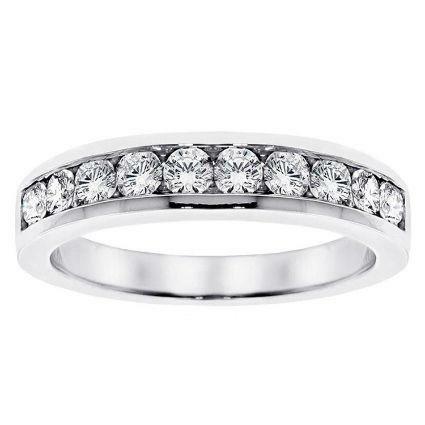 Three-Stone Bezel-Set Band - This Tungsten band from Amazon has 0.10 carat of round bezel-set diamonds and a unique carved shape. It retails for about $200. Hunter Diamond Band - This amazing ring from Sun Jewelry is made of 18k white gold and features .36 carat round diamonds in bezel settings. It has a brushed finish and retails for about $1,5000. Champagne diamond eternity rings and other bands featuring fancy colored diamonds make a unique choice. You can find colored diamond rings for men and women. Unusual diamond shapes, such as a channel-set baguette wedding ring, make a cool style statement for both men and women. 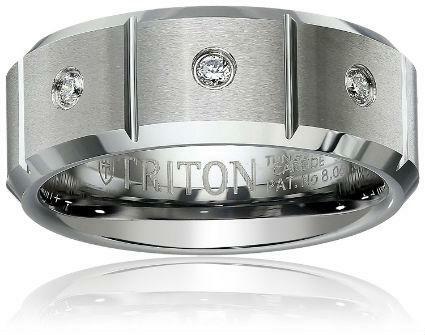 Princess-cut wedding rings are a classic choice, although they aren't as common as you might expect. You'll find these striking rings for both men and women. Emerald-cut bands are another great choice for men and women. You might even consider matching his and hers styles featuring this elegant shape. From elaborately engraved rings to simple channel-set designs, shopping for diamond wedding rings will open your eyes to the many options available. No matter which style of diamond wedding band you select, you'll find that the enduring sparkle of your ring gives you pleasure for years to come.